This statistic shows the results of a survey among adult respondents in the United States. The survey was conducted in August 2012. Respondents were asked about candidates’ competence regarding the handling of selected political issues. 54 percent of respondents stated they believed that Barack Obama would handle foreign affairs better, while 40 percent said they considered Mitt Romney the better candidate to handle this issue. 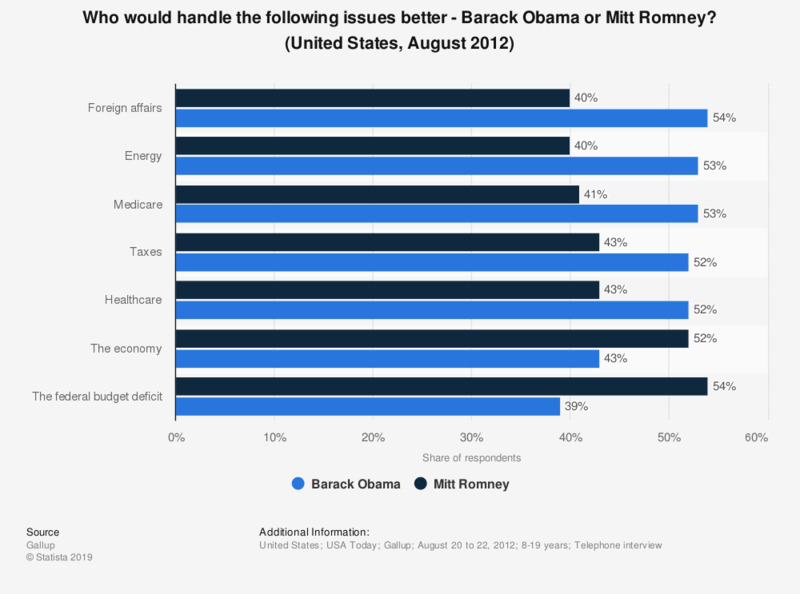 The source posed the question as follows: "Regardless of which presidential candidate you support, please tell me if you think Barack Obama or Mitt Romney would better handle each of the following issues. How about ...?" Missing percentage points to 100 percent are due to respondents answering with "no opinion" or "same".